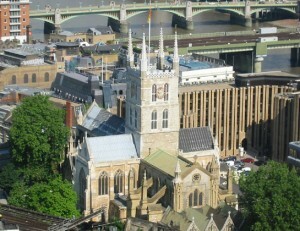 Southwark, also known as SE1, is one of the central areas in London, situated on the south bank of the Thames River. The London Borough of Southwark dates from 1965. Although it was ignored by visitors at the beginning, nowadays it has many interesting touristic attractions. This shift applies also to the inhabitants, workers and students that sum up to approximately 240.000 each year. Among the most interesting museums and galleries we can name: Clink Prison Museum (active from the early Tudor years until 1780), Cuming Museum (with more than 100,000 objects from all over the world), Design Museum (with items from the 20th and 21st century fashion world), Gabriel’s Wharf (a well-known marketplace with quality products), Garden Museum (dedicated to “garden enthusiasts”), Imperial War Museum (with collections that range from art to war), London Film Museum (dedicated to the British cinematographic industry) and Tate Modern (with plenty of modern art galleries). Fun activities can be found at any corner. You should definitely try visiting the following: London Eye (a British icon designed by Marks Barfield), The London Bridge Experience (a mix of special effects, real characters and animation, dedicated to children over 15 and not only), London Dungeon (translated in 90 minutes of powerful emotions and visual effects, while witnessing 1,000 years of history), Namco Funscape (a loved computer games arena) and Sea Life London Aquarium (one of the biggest aquaria in Europe). The theatres and concert halls are also worth your time and attention. Some of the most important are: National Theatre (established in 1963, with three current spaces: the Olivier Theatre, the Cottesloe and the Lyttelton), Shakespeare’s Globe (a replica of William Shakespeare’s theatre) and Royal Festival Hall (known for its famous concerts and art venues). Christianity is the dominant religion, but all sorts of beautiful churches can be found here, like: St George’s Cathedral (Roman Catholic), Southwark Cathedral (Church of England) and St Mary’s Cathedral (Greek Orthodox). There are also a few known and appreciated educational establishments: London South Bank University (LSBU) with almost 20.000 students, University of the Arts London and King’s College London, one of the largest European teaching hospitals. In order to get rail transport from London Gatwick Airport to Southwark (SE1), you will have to take the Gatwick Airport Train (that comes every 20 minutes). Also, you can choose the London Gatwick Bus (every 20 minutes) and then Victoria (Grosvenor Gardens) that arrives every 15 minutes. The total journey would take about 35 minutes with the train and 1 hour by bus. Another option would be taking a transfer from Gatwick Airport to Southwark. So as to travel by car from London Gatwick Airport to Southwark (SE1), you must take the M23 and A23. London Gatwick Airport is 27.6 miles away from Southwark (SE1). A journey by transfer from London Gatwick Airport to South with 247 Gatwick Airport Transfer is going to last around 1 hour and 26 minutes. The price for a transfer service from London Gatwick Airport to Southwark (SE1) starts from 55 GBP.